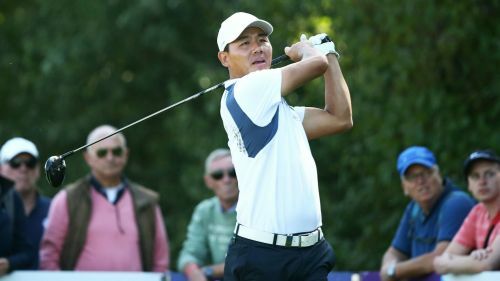 Wu Ashun extended his advantage to three shots at the KLM Open after another fine showing at The Dutch as Jonathan Thomson rocketed up the leaderboard. Overnight leader Wu added to his opening-round 64 with a five-under-par 66 on Friday to record his best 36-hole score on the European Tour. While there was no repeat of the bogey-free round he enjoyed a day previously, Wu made seven birdies and dropped just two strokes to move to 12 under for the tournament. Thomson, who lost out in a play-off at the Made In Denmark this month, is his nearest competitor with the Englishman, who started at the 10th, birdieing seven of his opening nine holes – including a remarkable run of six between the 12th and 17th. Wu holds his first European Tour 36-hole lead. Three bogeys with as many gains on the way home slowed his progress slightly, but Thomson is well in the hunt heading into the weekend. David Drysdale and Li Haotong are just a further stroke back in a tie for third, while Chris Wood is one of three plays five shots adrift.